Here’s an all new video of Jingle Bells easy ukulele tutorial featuring a split screen with Jenny fingerpicking the melody tab on one screen and doing the all-down strum pattern on the other. Although Christmas is still a few weeks away, it would be great to start with this Jingle Bells easy ukulele tutorial. It takes a couple of weeks or so for ukulele beginners to master songs on the ukulele. So starting on it now will have you ready to strum your ukulele along with Jingle Bells and other Christmas carols in time for the holidays. So here goes our Jingle Bells easy ukulele tutorial. You’ll need only three easy chords which are C, F and G7. And the strumming pattern is all down strums. First, Jenny and Rebecca shows how to sing and strum the song. Then at the end, Rebecca continues with the all-down strumming while Jenny fingerpicks the melody. Also, Jenny provides some great tips on fingerpicking. In fact, you could play Jingle Bells too for Thanksgiving. Did you know that the song was originally intended for Thanksgiving? Hence there being no mention of the word Christmas at all in the song. However, after the song’s initial publication in 1857, choirs and musicians have included the song with their Christmas selections. Thus, this lively song became one of the most popular Christmas songs around the world. And it was also the first song to be broadcast from space by Gemini VI astronauts on December 16, 1965. 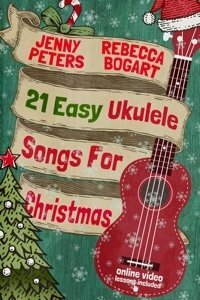 Therefore, we’ve included this bouncy holiday song in our 21 Easy Ukulele Songs for Christmas book. Aside from Jingle Bells, this best-selling Christmas book includes other much-loved Christmas songs like Silent Night, Joy to the World, Oh Christmas Tree and The Twelve Days of Christmas. Before then, how about mastering 21 heartwarming Christmas songs with your ukulele? This easy to follow book coupled with video tutorials helps you to do just that. Impress your loved ones during Christmas with your awesome uke skills as you strum out those familiar, lovely tunes. While many other popular Christmas song trace their origin to Germany or Europe, Jingle Bells is distinctly American. James Lord Pierpont, a New England born composer, wrote the lyrics and music to the song which he initially entitled One Horse Open Sleigh. Needless to say, the song became known as Jingle Bells and to this day more than 150 years after it was written, it remains world famous. Indeed, Jingle Bells is sang all over the world during the holiday season and has French, German, Spanish and Swedish translations to name a few. 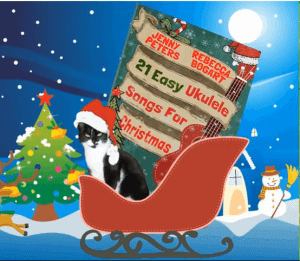 We hope you enjoyed this Jingle Bells easy ukulele tutorial which also features our musical pet, Claire the Cat. Claire clearly loved listening to the tutorial, serenely perched on Rebecca’s shoulder. Although at the end, she appeared to be curious about Jenny’s fingerpicking technique. Also, Claire is that cat you saw on the intro sitting on the sleigh. Looking for more ukulele tutorial on Christmas songs? Check out our Top 10 Ukulele Christmas Songs blog here. Happy strumming! Get free ukulele sheet music in your inbox every week. Enter your email below and get three free songs now! Send me my 3 songs!